Nice view of San Francisco from south side of Angel Island. I don’t know where I got the idea, but I always assumed the paved road circling Angel Island was flat. Wrong. A visit to the island made my bucket list, so we headed for Tiburon to pick up the ferry; it’s a 10-minute ride to the island, which costs $15, plus $1 for hauling the bike. Tiburon is preferable to San Francisco when driving from a distance. I considered renting a bike, but the cost of the rental, around $50, convinced me the logistical inconvenience was worth it. However, if you’re interested in renting an electric bike, this is a good time to try one out. With beautiful weather, the bay crossing couldn’t have been smoother. We exited the ferry and I started riding on the fairly steep and unpaved single-track trail that climbs up to the perimeter road. It’s not a very friendly route for a tourist. What’s odd is that there’s a paved road at the wharf that goes to the perimeter road. I’m guessing the park service doesn’t want to deal with yahoos blasting down the steep paved road into crowds of tourists. I took a clockwise route so that the view of San Francisco and the Golden Gate Bridge would be my reward on this five-mile loop. There’s a climb of about 7 percent for a ways before the road levels near the immigration station. A lot of history comes with the island, but I won’t bore you with the details. The road begins climbing once past the somber-looking buildings of Fort McDowell. The south side of the island has the steep spots. I didn’t sign up for a 16 percent grade, but that’s what I read on my Garmin. It’s followed by a steep descent. The best views of San Francisco are at the Battery Drew pullout, followed by Battery Ledyard. Skies were clear, so I enjoyed the spectacle. In less than an hour I finished the loop, after another descent. I didn’t check out the dirt road higher up that circles the island, but based on what I saw of it, it’s best suited for a mountain bike. 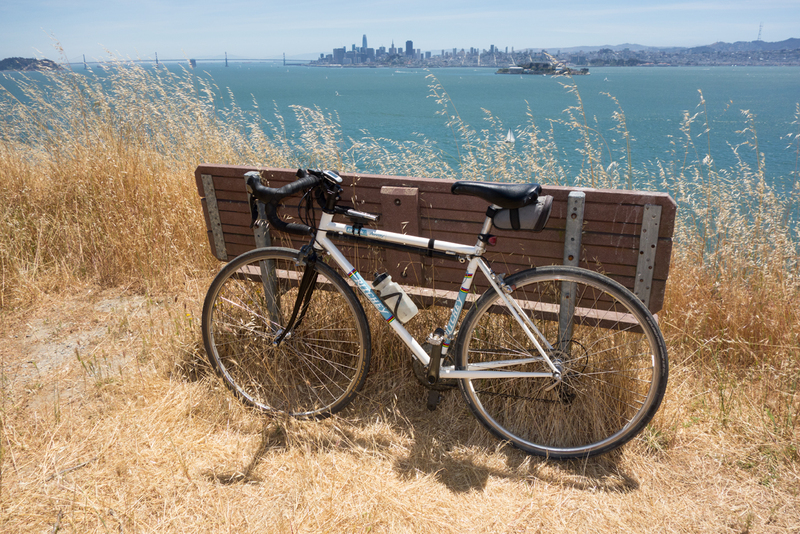 While the ride itself is no picnic, I can recommend Angel Island as a place for a picnic. Maybe in another dimension where bikes rule the land, this island is the site of a bike race. I can see that happening. It would be an interesting course. View of Angel Island using a heightmap. This entry was posted on July 20, 2018 at 6:43 pm and is filed under Ride reports. You can follow any responses to this entry through the RSS 2.0 feed. You can leave a response, or trackback from your own site. Regarding that “dirt road higher up that circles the island”, I didn’t have any problem with 35mm tires on a hybrid bike. The climb pays off — there are even better views from higher up, if I remember correctly. Amazingly I never visited Angel Island in the almost 50 years I lived in the BA. 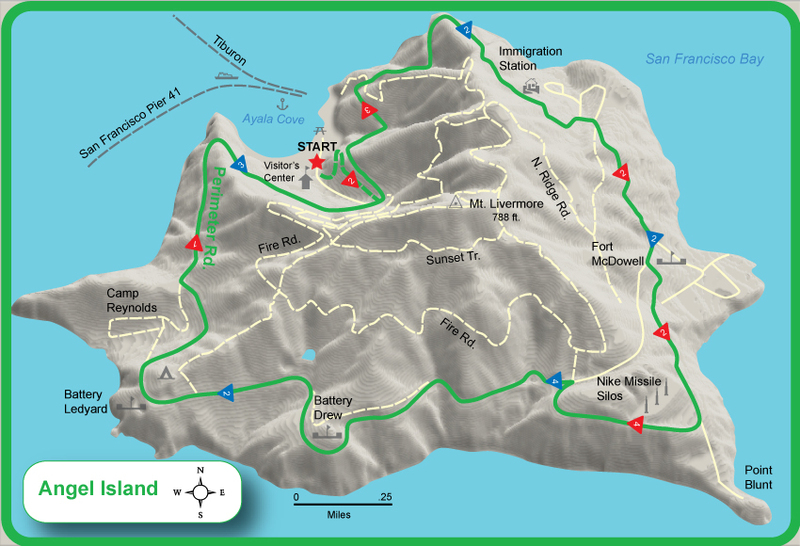 However, if it’s only a five mile route around the island, I think I’d just hike it and avoid the bike hassles.